This past Spring, before he became a restricted free agent, the Toronto Maple Leafs signed Nikita Zaitsev to a seven-year, $31.5 million deal. The $4.5 million average was not much of a surprise – he is a 24-year-old right-handed defenseman who led all rookie defenders in time on ice per game and finished third among first-year players in points (albeit as an older rookie). He had KHL leverage, fits into the team’s aging curve, and faced tough assignments all year — even if it was to poor results. That list is a mixed bag of results right now, Zaitsev included. This season, he has a new partner in Jake Gardiner — after primarily pairing up with Morgan Rielly last year — and his usage has also changed. Zaitsev has posted a 46.87CF% so far this season playing primarily against the other team’s top opponents while starting 45.5% of his shifts in the offensive zone. He remains relatively productive, playing to a 30-point pace with little PP time, but he is not the most offensively gifted or great at transition as he has only 14 shots on net in 19 games this season. 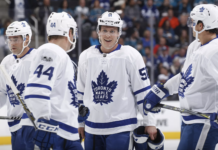 The team has relied on him big-time to eat up shorthanded minutes — that can wear down anyone — and he has been effective in that role as the Leafs have about a league-average penalty kill so far this season. At this point, Zaitsev is playing like a second pairing, penalty-killing specialist that can produce at a respectable rate — although it is concerning that Gardiner has struggled with him this season after looking great last year, and now Rielly looks great away from him. The early returns on the $4.5 million average annual value look fair based on the market, but that seven-year term is cause for legitimate concern. – For a few years now, I have noted in this space that Morgan Rielly does not have a big shot (particularly a slap shot), which can make it hard for him on the PP. Teams have generally sagged off of him and pressured the half wall because his lack of slap shot, and one-timer in particular, allows penalty killers time to get back in position when he has the puck. This season, he has made a great adjustment, channelling his inner Cody Franson and developing a fast little snap shot that he can get through traffic and create havoc. Earlier this season, he scored a goal against the Red Wings like that by just focusing on getting it off quickly (a little sneakily, too) and to the net. Against the Bruins this past weekend, he scored a similar goal on a ‘snap shot one-timer’ of sorts where he quickly cradled it, got it to the net, and benefitted from a friendly bounce. He leads all defensemen on the team with 47 shots on net, 27 ahead of second place (surprisingly, that’s Andreas Borgman). His 2.5 shots per game average is a .25 increase from last season. Before the year started, I noted that Rielly might naturally be in for a big year due to a reduced role defensively and more PP time, but he has also made a nice little adjustment here. – The player who leads the team in shots on goal so far this season? That would be William Nylander, which is in part due to Auston Matthews missing the last three games and James van Riemsdyk missing a game. He has three goals on 55 shots on net — 5.5 shooting percentage, which is sure to rebound at some point. Without Matthews playing, his ice-time has actually decreased: 15:55, 14:53 and 16:11 were all below his average of 17:19 on the season. While Matthews – Nylander is a dynamic pairing (one of the best in the league, as far as I’m concerned), it’s been noticeable how Nylander has become a little reliant on Matthews and used to where he’ll be on the ice. This week, he lapped the zone in each game looking for where Matthews would normally be in the high slot and he wasn’t there. The coaching staff has shifted Nylander around a few times during the games to get him comfortable and find the right matchups. – While Nylander likes to take the puck wide off the rush and circle around the net, Rielly’s goal against Boston was a good example of a classic Babcock play – Mitch Marner gains the zone, there is not much time or space to make a play, and he throws a puck to the net looking for a rebound while his linemates drive the net. This is a play we see pretty regularly with the Leafs. – I have to give credit where it is due: With Matthews down, van Riemsdyk has stepped up. In the Boston home-and-home, he had 10 shots on net and four points (three goals). His PP goal in Boston is a great example of how he can be most effective – he wins the battle against Chara after a scrambled faceoff, gains possession, goes to the net, boxes out using his body, and tips the puck in the net. There is no doubting his skill, but he is still 10th among forwards in total average time on ice per game despite being second on the team in goals, third in shots on goal, and on pace for a 68-point season (which would be a career high). In the three games without Matthews, his ice time has not exactly shot way up, either: 12:04, 16:57, 12:11. Even with a soft role, his production is going to warrant him getting paid big money, but how do you pay a someone big, long-term money if they are not even on your top two lines? Wonder if that language barrier has been an issue with Andreas Borgman in his adjustment. Earlier this season, Nikita Zaitsev conducted an interview where he talked about the language and said he was fine with it. Hainsey is now up to 5:08 per night shorthanded, while Zaitsev is at 4:04, which are first and sixth in the NHL, respectively. We will see how sustainable that is over the course of the season, especially for the 36-year-old Hainsey. “There is one very good thing about Cincinnati and that is our coach, Mike Babcock. No one knew then that he would go on to be a superstar in his own right, winning Stanley Cups and World Cups and Olympic gold medals. We just knew he was a no-nonsense Saskatchewan boy who could play the game well enough to know his way around the minors. Babcock is not a giant—six feet, about 220 pounds—but he has a gigantic presence, and during my time in Cincinnati he was like a lunatic compared to what any of us had been used to. I had never seen a coach like him before, had never seen players respond to or fear a coach like they did Babs. One of my favourite moments of last season was Babcock making a line change with under three seconds left when the Leafs clinched a playoff spot vs. Pittsburgh. They were up by two so the result was already a foregone conclusion, but he was still intensely barking orders. The guy is just relentless and never lets up (which is why I was also disappointed he did not challenge the St. Louis goal where Andersen got slashed, but that’s a different story). In the last few weeks he has received some heat for the first time since getting hired by Toronto, but at this point, I don’t think there’s much to be complain about on the whole. He has done an excellent job. I noticed the Leafs activated their defense a bit more this week. This is a great example from Connor Carrick, and it goes hand-in-hand with something we have discussed in this space the last few weeks: Teams are trapping the Leafs with a 1-2-2 and waiting for turnovers. One way Toronto has adjusted back is getting their defense to carry the puck up more instead of throwing it into the neutral congestion. The Leafs lack a lot of things on defense, but skill is not one of them. This is a nice little tweak to hopefully open up more space for the forwards. Carrick was not the only one to do this last week, as almost every defenseman has gone for a few rushes (meanwhile, Roman Polak has remained a healthy scratch). 1. I think we are seeing that Josh Leivo is not great on the fourth line in that grinding, checking type of game. He has looked good as a complimentary scorer — whether it is with Kadri at even strength or on a power play unit — but on the fourth line he does not have the same type of impact. The line has still been able to generate some good cycle shifts – which is one of Leivo’s strengths – but Leivo is also great in front of the net and at capitalizing on his scoring chances, which is why he relies on his linemates to help him. The team is expected to call up Nikita Soshnikov this week due to his contract situation, and I think he’d be a better fit on that line. 2. I think Curtis McElhinney had a good game against Boston and is holding off a potential callup from the Marlies — for now. I will be interested in how they deploy him in the next stretch of games. The Leafs’ next back-to-back is Friday, November 24 and Saturday, November 25 against Carolina and Washington, respectively. In the seven-day span before that, they play four games, with one coming against Arizona. I think that’s a good opportunity to get McElhinney back in there while resting Andersen. 3. I think I’d like to see Andreas Borgman (24 seconds per game) and Connor Carrick (three seconds per game) get a bit of a longer look while shorthanded to see what they can do. There is no evidence either way about what they can do on the penalty kill, and it would be nice to see the Leafs reduce Hainsey’s and Zaitsev’s minutes. There will be growing pains, of course, but the long-term reward would be worth it if just one of them pans out there. This is the time to experiment with something like this. 4. I think the defense has strung together some respectable games as a unit and it should be more of the same with these pairings. We have talked in this space about swapping some of the pairs, which I still think might be beneficial, but the last few games they have settled down a bit — at least against Boston (the team struggled as a whole against Minnesota, I thought). 5. I think the way Babcock is deploying his forward lines – swapping Brown and Nylander depending on the defensive matchup – is the smart way to go about it. We are also seeing that Hyman can really inject some life into a line when he is away from Matthews. That is something to keep in mind for when Matthews is healthy. I’d still like to see Nylander at center, but we have seen this from Babcock before – he is not moving guys away from the position they will be playing once healthy players return.